I won this book in a Goodreads Giveaway a very long time ago. I kind of wish I had read it a few years ago when things in the US weren’t quite so openly depressing but alas I read it now and it hurt my heart so much. 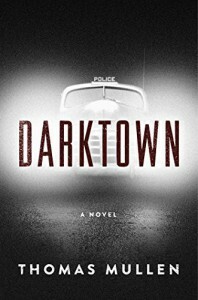 Dark Town is a mystery and an unflinching look at race relations in the not so long ago past. Even worse, much of it is depressingly still very relevant today. It takes place in the 1940’s when segregation and racism was on full awful display. And if today’s news gets you down, reading this book right now sure won’t help your state of mind. There is so much prejudice and hatefulness in this story that it will make you angry and sad. This is not a book you want to pick up thinking you’ll escape into. A murder occurs and the author delves deep into everyone involved in the situation. What is uncovered is a whole lot of cover ups, corruption, and other assorted ugliness. It’s very well written and the descriptive language is so very excellent. "A harsh word would knock him over"& "He hit the door like it owed him money." You should definitely read it if you enjoy a good gritty historical murder mystery. But I’m warning you, it’s probably going to make your blood boil.